Various resources exist to define and shape nursing leadership. The Registered Nurses’ Association of Ontario (2013) has developed a best practice guideline on how to develop and sustain nursing leadership. Further, Huston (2008) suggests eight skills that will be essential nurse leader competencies for 2020. The ability to envision and proactively adapt to a health care system characterized by rapid change and chaos. Various leadership theories and approaches have emerged over the years, in response to various contexts and societal and generational values. Leadership has become less hierarchical, less focused on tasks and more on relationships with collaborative frameworks for leadership evolving over the years (see Chapter 1). Nurse leaders, including nurse managers, must actively demonstrate the same professional, evidence-informed, innovative, collaborative, compassionate behaviour they expect of their staff nurses. This begins with clarifying their personal, professional, and organizational values. Leaders must find their own voice, then clearly and distinctively give voice to their values. Professional values can be drawn from the CNA Code of Ethics (2017a), which is applicable to nurse leaders in all domains (see Chapter 10). Nurses, including nurse managers, can find themselves in ethical distress as they try to manage and lead within an environment of constant change and resource constraint. Demonstrating ethical leadership is critical to their role as professional nurses. The next two sections outline the nurse leader’s ethical responsibilities in safe nurse staffing and in medical assistance in dying (MAID). One of the key functions of a nurse manager is to manage resources, including budgets and personnel. Appropriate, evidence-informed, safe nurse staffing is a key responsibility of nurse managers, one that can often result in moral distress. Safe nurse staffing is critical to patient, provider, organizational, and system outcomes (Berry & Curry, 2012). The CNA and the Canadian Federation of Nurses Unions (CFNU) have developed an online, evidence-based safe nurse staffing toolkit made up of four modules. It is designed to provide nurse managers—or any nurse who has the responsibility and authority for staffing—with the knowledge, tools, and resources required to fulfill that responsibility in a variety of settings. 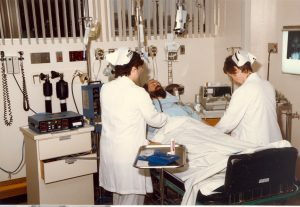 [n.d.], “Hospital Staff Tending to Patient,” photo courtesy of the Saskatchewan Health Authority (formerly Regina Qu’Appelle Health Region) collection number 2003.8-1578, is licensed under a Creative Commons Attribution 4.0 International License. Ethical (or moral) distress arises in situations where nurses know or believe they know the right thing to do but, for various reasons (including fear or circumstances beyond their control), do not or cannot take the right action or prevent a particular harm. When values and commitments are compromised in this way, nurses’ identity and integrity as moral agents are affected and they feel moral distress. June 2016 saw amendments to the Criminal Code that made it possible for eligible persons to receive medical assistance in dying (MAID) in Canada. Canada’s nurses have a significant role in providing high-quality, person-centred end-of-life care, which includes palliative care and natural death and, in some jurisdictions, MAID. This is a key area of nursing practice in which nurses and nurse managers will draw on their personal and professional values and ethics. Nurse managers may be responsible for the operational aspects such as policy development, coordination, and management of the delivery of MAID on their unit or work setting. They may also serve as an ethical resource for their staff nurses as they choose whether or not to participate in MAID. The Canadian Nurses Association has released a National Nursing Framework on MAID that includes seven core values and responsibilities derived from the CNA Code of Ethics; these values and responsibilities are meant to be used as an initial lens through which all ethical guidance and decisions for MAID are viewed. to be a resource that supports nurse regulators, clinical nurse leaders, administrators, employers, and interprofessional health care teams in developing policies, guidelines, processes, and services that use the knowledge and skills of nurses appropriately to provide or aid in MAID. In 2016, the Saskatchewan Registered Nurses’ Association issued a Guideline for RN Involvement in Medical Assistance in Dying, which outlines the different roles of RNs and RN(NP)s who are involved in MAID. Makaroff, K., Storch, J., Pauly, B., & Newton, L. (2014). Searching for ethical leadership in nursing. Nursing Ethics, 21(6), 642–658. The aim of the study was to investigate how frontline nurses and formal nurse leaders (FNLs) envision ethical nursing leadership. The researchers used a meta-ethnography methodology to guide their analysis and synthesis of four studies conducted with 601 participants in Canada (from 1999 to 2008) that explored the notion of ethical nursing leadership. The intent was to determine what frontline nurses in practice expect of their formal nurse leaders regarding ethical leadership, and importantly, how formal nurse leaders perceive ethical leadership. Two main themes are reflected in the four studies. First, ethical nursing leadership must be responsive to practitioners and to the contextual system in which they and FNLs work. Second, ethical nursing leadership requires receiving and providing support to increase the capacity to practise and discuss ethics in the day-to-day context. This work draws attention to the important, and somewhat neglected, need for FNLs to have organizational support in order to enact ethical leadership. Frontline nurses do not necessarily perceive FNL as visible, responsible, and supportive. This highlights a gap between perceptions and actions that requires more attention. FNLs may face challenges in their ability to enact ethical nursing leadership. Ethical leadership is an important aspect of creating an ethical climate in which both nurse and patient outcomes are enhanced. Yet FNLs may find themselves caught in the tension between enacting ethical obligations of the profession and working within the priorities and needs of their health care organizations and governments. Chief among these challenges is navigating the current health care environment in which values related to quality of care may be of second priority to business and market-oriented values of efficiency and cost effectiveness. Organizational resources such as vision, mission, values, and codes of ethics can be utilized by FNLs to enact the responsibilities and competencies associated with ethical nursing leadership. There is a need to focus on and develop the ethical competencies of FNLs as part of organizational leadership. A key rationale for strengthening ethical nursing leadership is to support ethical nursing practice as part of excellence in patient care. The Institute for Healthcare Improvement (2017) has identified four main responsibilities of leaders to achieve safe, reliable, and effective operational excellence. These four responsibilities correlate with newer, empowering leadership styles such as transformational and authentic. One might add that ensuring value alignment also requires the application of professional values such as those found in the CNA Code of Ethics. Guarding the learning system. Fully engaging in the work of self-reflection that leads to transparency; understanding and applying improvement science, reliability science, and continuous learning; and inspiring that work throughout the organization. Creating psychological safety. Making sure that anyone in the organization, including patients and families, can comfortably voice concerns, suggestions, and ideas for change. Fostering trust. Creating an environment of non-negotiable respect, ensuring that people feel their opinions are valued, and any negative or abusive behaviour is swiftly addressed. Ensuring value alignment. Applying organizational values to every decision made, whether in service of safety, effectiveness, patient-centredness, timeliness, efficiency, or equity.